During the Local Forums in The Netherlands, the project "Lentmark 1" was develeped. The pilot project aims to construct a 18 meter high watch tower with used materials. The tower will be build by at least 10 unemployed youngsters who are enabled to develop their occupational competences in the construction area, specific in working with and techniques for used materials. The pilot project is connected to the elaboration of the city of Nijmegen with some 15.000 new houses to be built between 2010 and 2025. It is lead by the EGS partner ROC Nijmegen. The teacher training was carried out by ROC Nijmegen. ROC Nijmegen is a Regional Educational Centre. It offers students, both young and mature, courses in secondary vocational education and in adult education. In addition it provides contract teaching for companies and institutions. 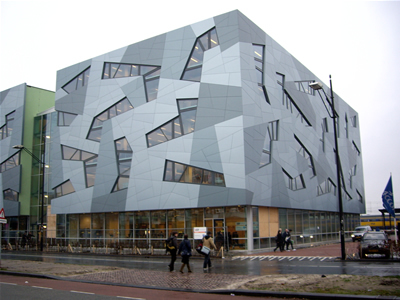 Approximately 12,000 students are enrolled at ROC Nijmegen. The centre has over 1,100 staff. The Netherlands has scores of ROCs. Some 40% of the inhabitants of the Netherlands are following or have followed a course at a ROC. ROC Nijmegen consists of different sectors, each of which provides different, related courses. In addition it has a branch in Boxmeer, MBO College de Maasvallei, and one in Druten, MBO College Land van Maas en Waal. There are also regional locations concerned solely with adult education. In the picture you can see the new building for the departments of Economical Studies and for studies in Health and Welfare. In this building the newest technology for climate control has been implemented. There is a closed water circuit which is partly stored in a basin some 30 meters into the ground and is partly used for climate control. During summer the part with cooled water is used for cooling the building and in wintertime hot water is pumped up for heating the building. If you want to read more, please have a look at http://www.roc-nijmegen.nl/.